Email newsletters are one of the tools to tell 'Valuable information for subscribers'. 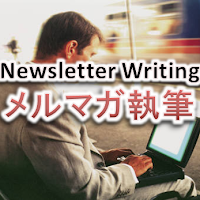 The position of the e-mail newsletter, although which differs greatly depending on the issuer, for example, it is "marketing tool that directly related to the sales" for the mail-order company, also is an "Induction tool that greatly influences the access" for media sites. That is, it is not a few that email newsletters play a 'crucial role of the business'. It is desirable that the process of creating manuscript would be 'processed quickly' and 'hardly mistaken'. The following business process sample is an Email Newsletter Manuscript Creating Flow that about 20 manuscripts per month will be created. Both of "Regularly issuance three times a week Tuesday, Thursday and Saturday" and "Publishing in arbitrary timing" are assumed. These work procedures or automatic processing are devised to prevent retention and mistakes. Every business has to do with Contracts. 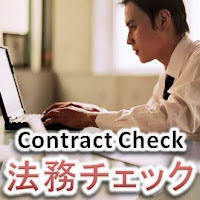 And, "Conclusion of a Contract" it is a very important human process, yet it is cumbersome. It requires division of labor because of specialization. Want to make it efficiently more even a little bit. By the way, Japanese major companies demand 'Conclusion of NDA (Non-disclosure agreement)' in the beginning of a trade. However, what is written on the template is the mostly the duplication of "Unfair Competition Prevention Law" (1993). Sometimes matters about basic right as written in "Paris Convention for the Protection of Industrial Property" (1883) are added in the contract. Anyway, the company on the side of receiving the contract will be forced to 'barren work' of checking if "something strange have been written" or not. We would want to design the business processes in mind that the Legal check includes also extremely unproductive matters like "conclusion of NDA". In the following Legal Checking Workflow, Task of [2. Approve Draft of Contract] by the Boss and [3. Approve Draft of Contract] by the Legal are able to be skipped. In fact, sometimes things are promptly decided by 'Top-down', sometimes are approved from 'bottom-up'. You cannot tell whichone is always the better. However, it should be better recorded unitarily both of 'top-down decisions' and 'bottom-up approval', as decision information as an organization. The following business process definition is an example of 'a Decision-making process' that allows recording (aside the proposer) the final decision maker, decision time, decision content, in a same format. Decisions as an organization, it is sufficient to refer to the process that has flown on it. There, it never be recorded 'top-down decisions' as if it was 'bottom-up approval'. In this age of cloud computing, it is as a matter of course to digitize the "data of the decisions as an organization", but like this case, it is also important to assume multiple 'decisions as an organization flow' for securing organizational mobility. # You would hardly be able to even find the "decision of the past" if you had saved the 'request for approval documents' in 'paper'. 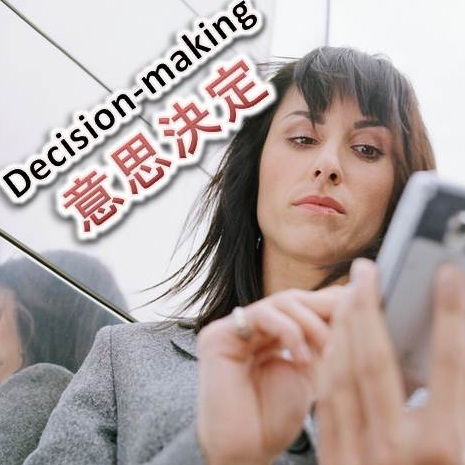 In Japan, there is a mechanism called 'RINGI, request for decision' the recording format of a bottom-up decision-making. Drawn up by the authority responsible for drafting stipulated by internal regulations, after obtaining the consent of the multiplayer, will be approved by the final decision maker. For example when placement "a massive advertisement", the people responsible for drafting must create a document that is an overview of advertising or the reason why the massive advertisement is needed, and submit along with an estimate of the cost of each ad. Actually, it takes considerable time and effort to the RINGI, the request for approval, to arrive at the approver. Is there really a need to "massive advertising"? There might be a need to be more "massive advertising"? The "risk" accompanying the ad have been supported? "Effect" obtained by the ad are expected correctly? has been done well at the time of the approval. That is, after the approval, work of advertisements placement will be processed surprisingly quickly and smoothly. In many cases, the top himself is not necessary to instruct for tasks of advertisement placement. RINGI is a mechanism that has been deeply supported by Japanese companies, and it would survive enduringly in the future. Workflow system goes well with Desk workers'. Translators for example, who spend most of their work stuck on their PC, they are really in good chemistry with Workflow. The following is a 'Translation flow' mainly for Web contents. It is a device which putting a document in Japanese in it, and the translation in English and in Spanish would be completed.(!?) After running this flow to some extent, gradually you will see the correlation of the amount of original document and duration of processing. and have been contributing to a significant reduction in office work labors. Some folks call these 'Three major applications of workflow'. It has been digitized (onlined), records have been remain automatically, and the aggregate has become extremely faster. Later, office work has been digitized one after another along with improving the environment, such as an internal LAN. These have come to be into the workflow as well. Especially, cross-department Workflow, and business between remote locations they are very significant to be digitized. Now, the cloud computing era of today. Workflow is not limited to internal operations. 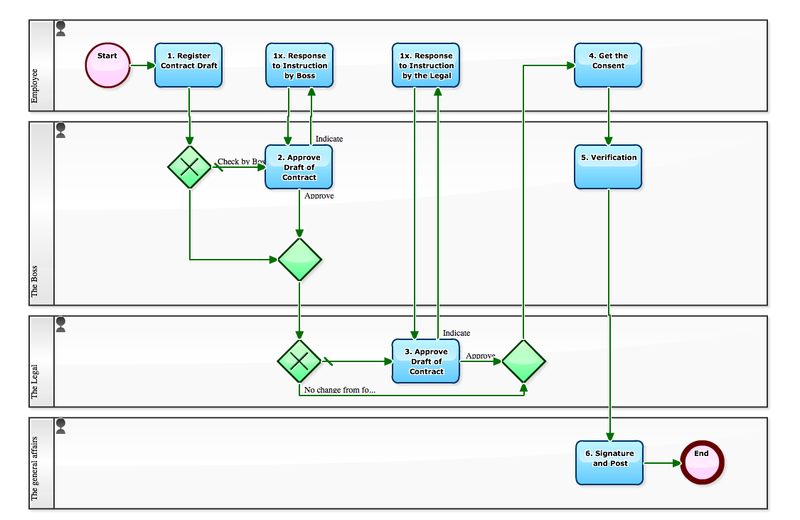 That is, operations of responding to an inquiry from the outside became able to be operated in the Workflow system as well. Specifically, "Product inquiry" or "Complaint", "Request for Quote" or "Personal Information Protection Counter", can now be processed electronically in accordance with operating procedures (business processes) as well. 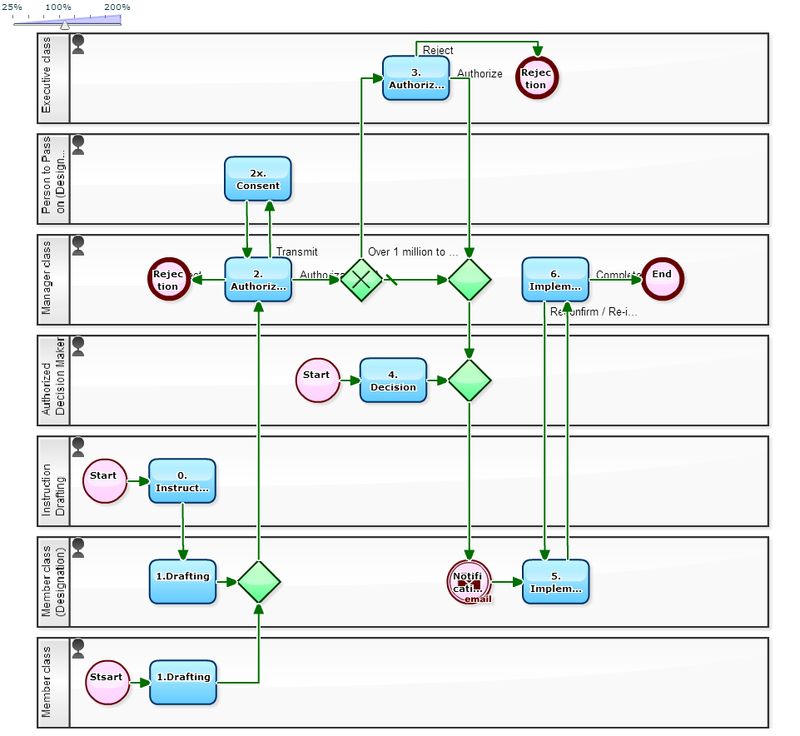 In the following workflow definition, it is possible to be incorporated in the same flow by the connective setting, such as (external trigger) inquiries on the Web site or by e-mail, as well as queries on Facebook and Twitter, etc.. 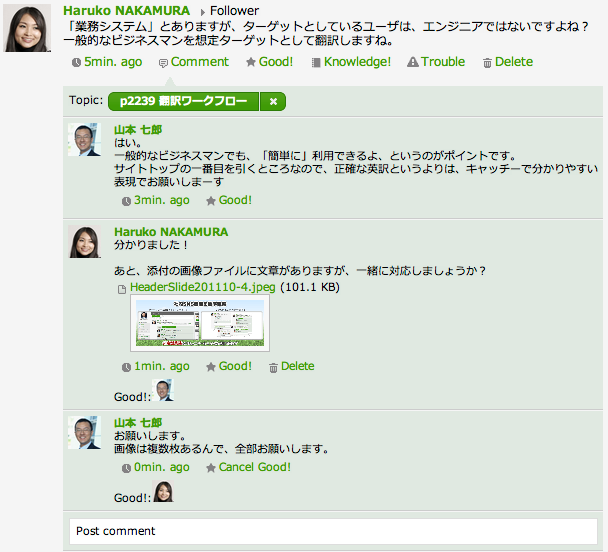 It can be branched to 'Translation' or 'advisory' in the middle of the Workflow.